The history of Saint Anthony's Church in Forest Grove, Oregon begins in 1908. Father F.J. Kettenhofen, pastor of Visitation Church in Verboort, purchased property on which the first church in Forest Grove was built. A house on the property was remodeled to serve as a rectory and a chapel. Archbishop Christie appointed Father J.P. Buck first resident pastor of the parish in 1909. The Extension Society gave Father Buck a large donation to build a new church and change the name to St. Anthony's Church. When he was appointed pastor in Forest Grove, there were a total of seven families. The building erected by Father Buck was intended to be the first floor of a future school. However, it was converted to a church. It served the parish for 46 years. Archbishop Christie dedicated the church on Sunday, August 27, 1911. In 1955 the parish purchased the South Park High School for $71,870, which included a large athletic field, a gymnasium, a house, and a three-story school with an auditorium. Work began in January of 1956 to remodel the auditorium as a church and school. A disastrous fire completely destroyed the structure in late February 1956. Our present church was built on the site of the old school. The parish purchased the stained glass windows from old Saint Joseph's Church in Salem. The windows were crafted between 1890 and 1910. Parishioners say that our church was "built around the windows." 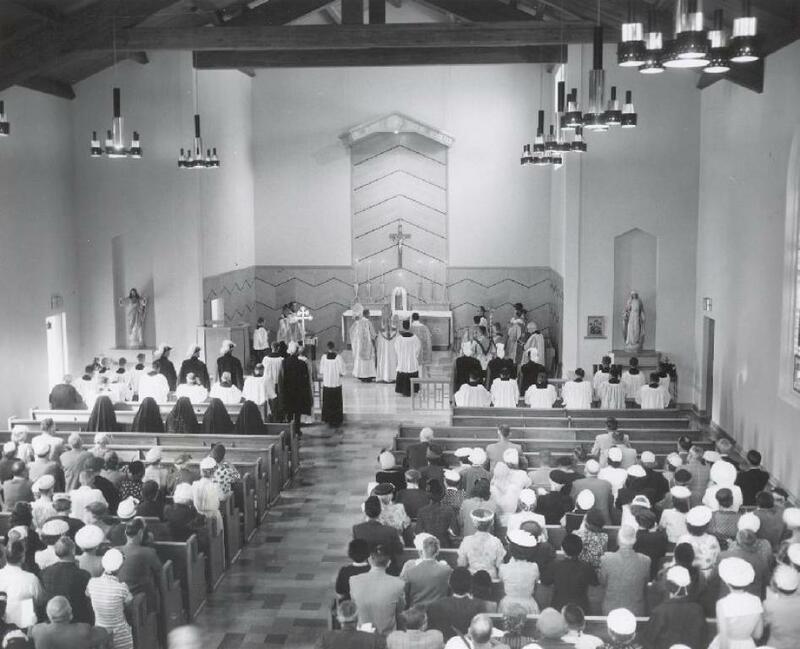 Archbishop Edward D. Howard dedicated it on September 23, 1957. The school began on September 9, 1963 and was a parochial school with grades Ist - 8th. But when the Sisters of St. Joseph returned to their mother house, it was forced to close in June, 1971. In 1976 St. Anthony's Prayer Group began. It has continued and, is the longest functioning group in the parish, 26 years, known now as the Praise Gathering. The most influential social outreach in the Forest Grove area, St. Vincent de Paul, began as a collection site, in the rectory, for FISH in 1973. It has traversed the whole campus from place to place, and now is located in the remodeled garage of the Rectory building. There has been a staggering increase in the requests for service, in the 1980's it was about 50 households per month and now is over 190 in the past months. Ground was broken on June 6, 1982 for the Parish Center. The first annual Italian Dinner was held there on Sunday, March 13, 1983. It's proceeds to be used to retire the parish debt. Meatballs, linguini, and sauce were a big hit with the public, and has continued to the present. To support our neighbor parish St. Alexander, Hispanic outreach was initiated in 1999. The community was originally very small but has increased to more than 300 per mass, and is continuing to grow. This has now become a vital part of St. Anthony's community with the guidance of Sr. Juana. The many accomplishments of this parish are the result of the vision and hard work of our pastors and parishioners who used their imagination, dedication and Faith to build a community in Christ here in Forest Grove.